The next step in the process is developing a time line of ownership from the first plat to current day. There are a couple resources that can help in this process: the property Abstract (if you can get it) and the County Auditor/Assessor. Use a spreadsheet to keep track of names, dates, and notes for each transaction. Your home’s “abstract” is a legal document that traces the ownership history of a parcel of land. It typically references and sometimes includes copies of legal actions that affect property ownership such as: original platting, subdivisions, owners’ names and “aliases”, bankruptcies, divorces and custody actions, easements, and foreclosures. 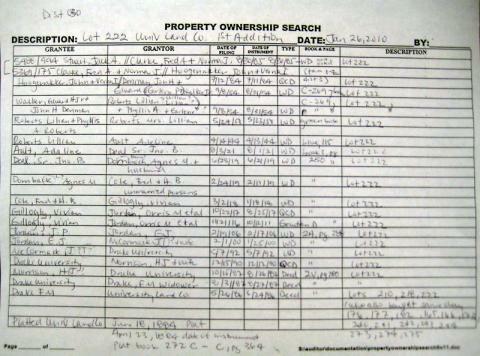 The following is an example “Chain of Title” log sheet that traces ownership of a property back from the current owner through the original plat. A full spreadsheet will include the Grantor (seller), Grantee (buyer), Date of Filing, Date of Instrument, Transfer Type, Book and Page, and Description. Click the following link to download a printable Chain of Title Worksheet.